The famous Messerschmitt Bf-109 single-seat fighter was one of the most important warplanes of WWII. Originally designed during the 1930's, and a contemporary of the equally-legendary Supermarine Spitfire, it was vitally important to Germany's Luftwaffe and was flown in combat by the highest-scoring fighter pilots in history. It was in service throughout WWII and was built in a number of significant versions that proved to be worthy adversaries of the very best of the Allied warplanes that it flew against. Bf-109's operated in all the major areas of conflict where German forces were engaged in combat and, in modified form, the type then had a post-war career in several countries that extended well into the 1950's. Pen & Sword Publishing is based in the UK. This book is soft-cover of 80 pages in 8 1/4" x 11 3/4" page format. 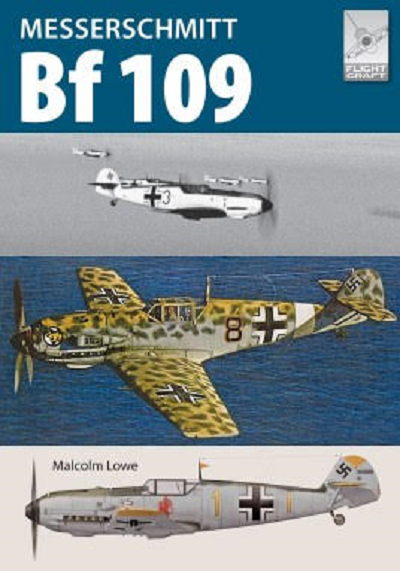 The cover art shows 2 color photos of actual Bf-109's. A Bf-109G-10 is shown sitting on the ground and a Bf-109E-1 is shown in flight. There is color photo of a Bf-109E-7 version model made up from the Eduard 1/48th scale kit and a color side profile of a Bf-109E-4. The back cover shows color photos of the Academy Bf-109G-5 (scale ? ), the Trumpeter 1/32nd scale Bf-109K-2 and the Revell 1/32nd scale Bf-109G-10. There are 113 black and white wartime photos in the book. These include: portraits of Willy Messerschmitt and Herman Goering, a F4 biplane, Messerschmitt's M-16, M-18, M-20, Bf-108, Arado Ar-68, Heinkel He-51, Arado Ar-80. a twin-fuselaged Bf-109Z, a Bf-109K with a radial engine, a Bf-109F/4V with a V-shaped tail, a PZL P-11C, a Spitfire, a Junkers Ju-52/3M, a British Wellington, a U.S. B-17, B-24 and P-51D. Soviet Polikarpov I-16, French Morane-Saulnier MS-406, French DeWoitine D-520, U.S. Hawk, Bf-109F-4, Bf-109G-2, Soviet Lavochkin La-5, Bf-109 (version ? ), Bf-109F and a Bf-109K. Bf-109V-7, Bf-109B-1, Bf-109E-3. Bf-109E-4.Bf-109E-1B. two profiles of a Bf-109F-4, three profiles of a Bf-109G, Bf-109G-/R6, Bf-109G-6/U2, two profiles of a Avia CS-199, HA-199 M11. Academy Bf-109K-4 1/48th scale, Academy Bf-109G-6 1/48th scale, Airfix Bf-109G-6 1/72nd scale, Airfix Bf-109E-3 1/24th scale, Allegent Bf-109D 1/32nd scale, Eduard Bf-109E-4 1/48th scale, Hasegawa Bf-109E-4, G-6 and G-14 1/48th scale, Heller Bf-109B/C, B, D, E-1, G-14, G-14AS & K-4 all in 1/72nd scale, Revell Bf-109G-10 (scale not mentioned), Trumpeter Bf-109G-2 1/32nd scale, Zvezda Bf-109F-2 1/48th scale, Eduard Bf-109B-1, E7 & E1 all in 1/32nd scale, Hasegawa Bf-109F-4 1/32nd scale, Trumpeter Bf-109G-1 & G-4 both in 1/48th scale, Revell Bf-109G-6 1/48th scale, Hasegawa Hispano HA-1112-M11 1/48th scale Bf-109C with Gray Matter conversion set used, Model Showcase Bf-109K-4 1/32nd scale. The last page in the book has a black and white cover art of Pen & Sword's "The Supermarine Spitfire" book over a black and white photo of Airfix's 1/24th scale Bf-109E-3 made up in Adolf Galland's markings. This is one terrific book for 109 modelers and aircraft historians alike.